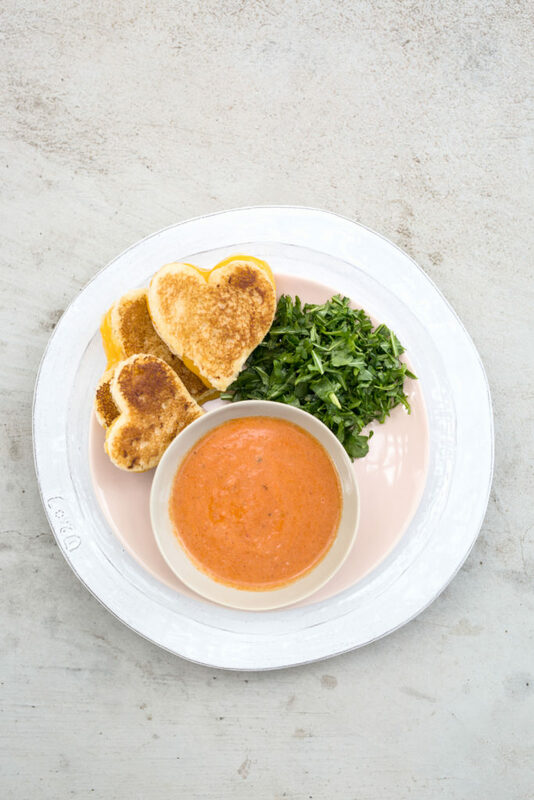 A Sweet Galentine's Lunch: Show Your Girlfriends Some Love! 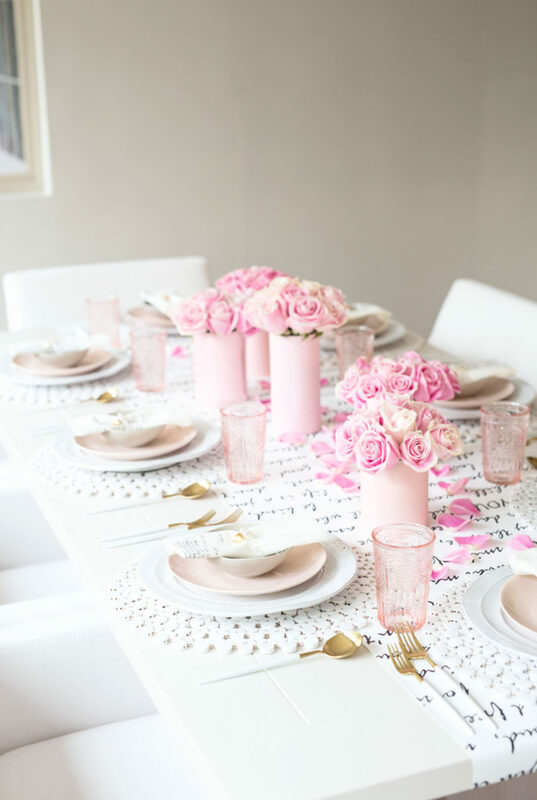 What could be more charming than honoring your best gal friends with a fun lunch and a special surprise gift for Valentine’s Day? 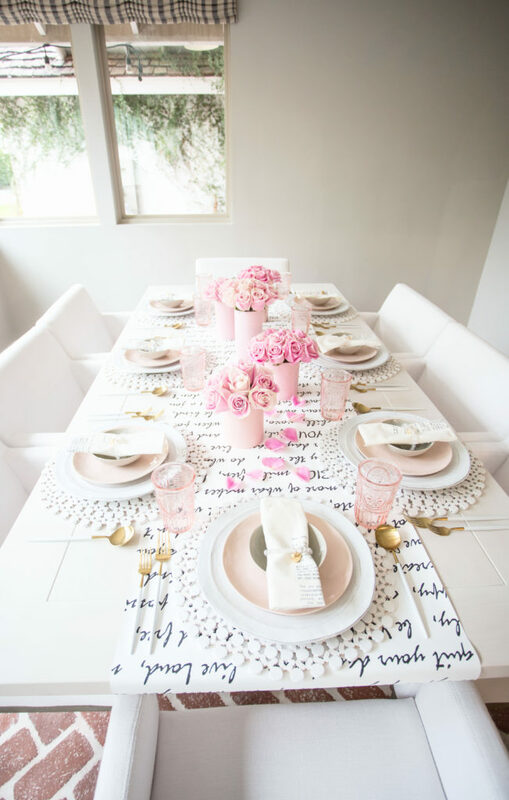 It really is the perfect time to show your girlfriends some love and celebrate these vital relationships that mean so much to our well-being. 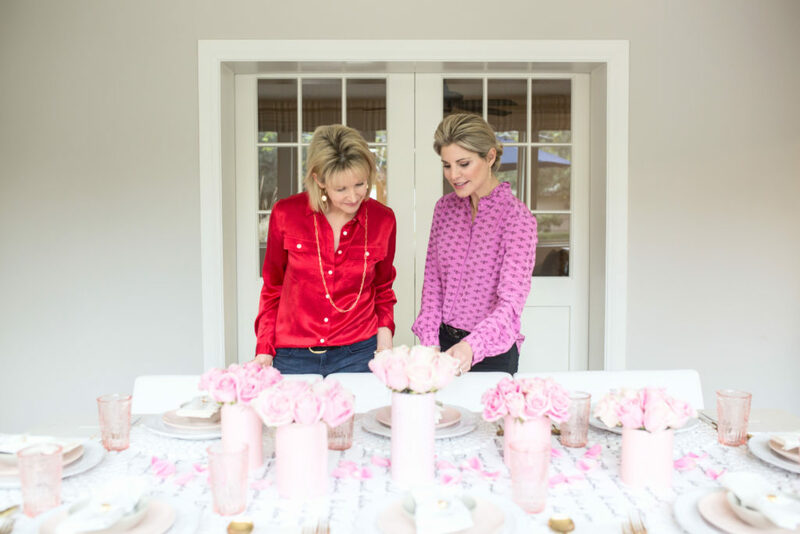 See how I collaborated with my friend, Julia Winter, a well-known jewelry maker in Phoenix to throw a sweet galentine’s lunch with thoughtful details, a bespoke bracelet, comfort food and some great DIY aspects. 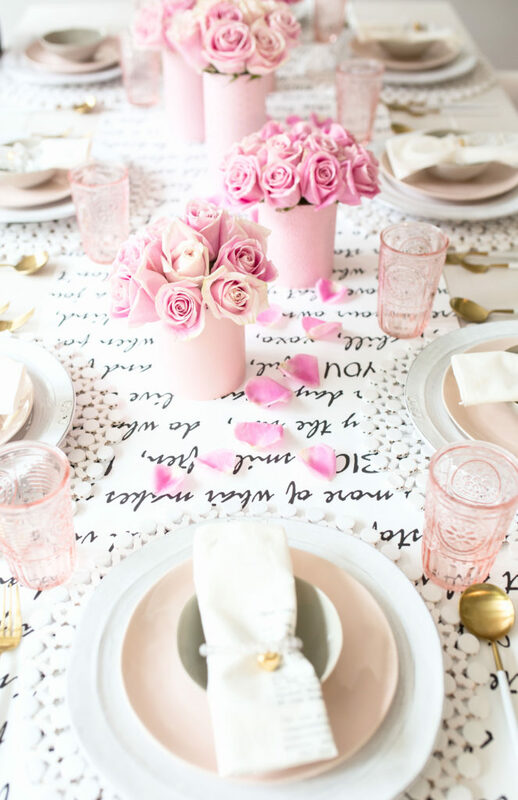 Instead of using a fabric table runner, I wanted to do something creative that reflected the endearing sentiments usually associated with Valentine’s Day. 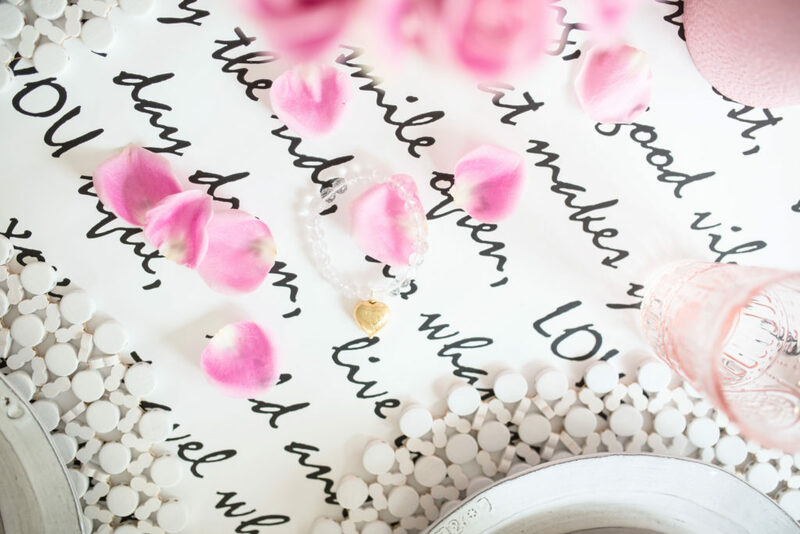 I found this wallpaper with hopeful, supportive and promising words and simply ordered it by the roll – it couldn’t have been easier or more perfect. 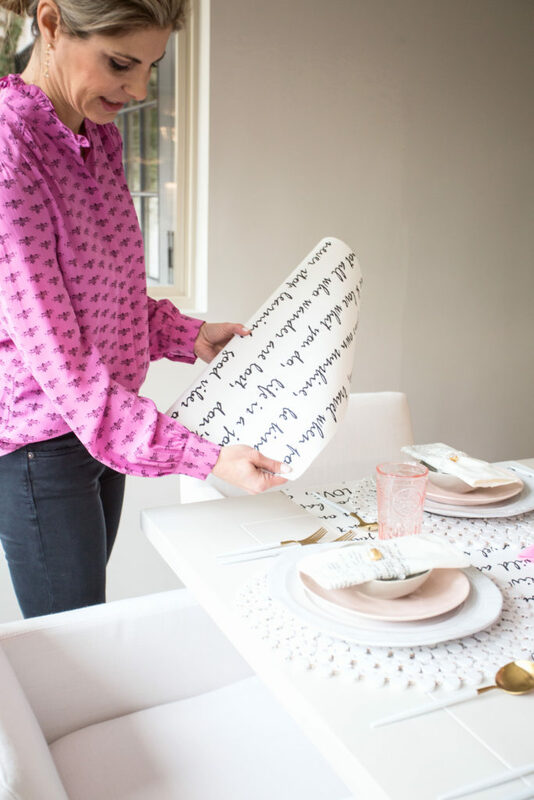 I love combining DIY elements, like my paper-wrapped vases, with unexpected ideas, like my wallpaper table runner, for a unique table! 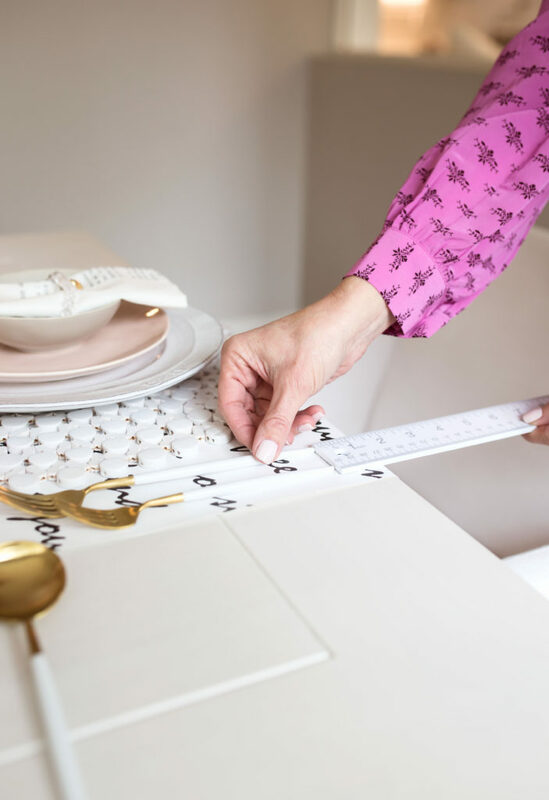 The ruler comes out when I am using multiple utensils to make sure they’re even and straight. 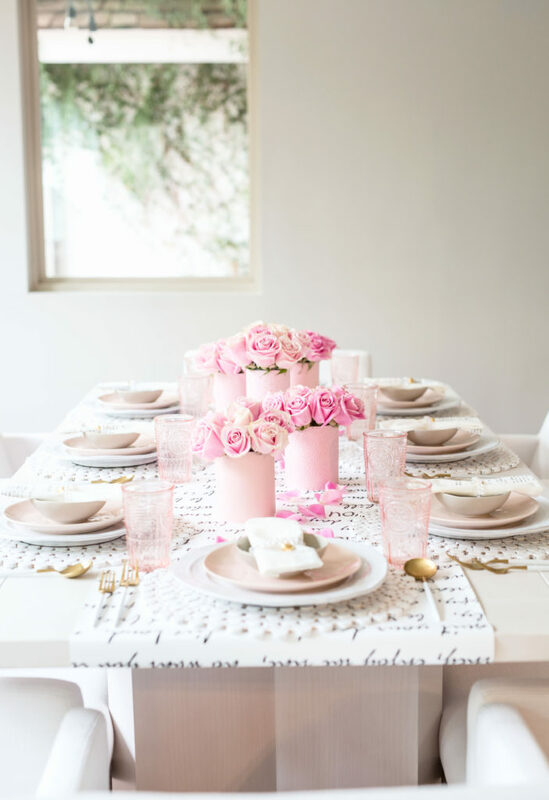 Using my bamboo placemats as a base, I layered the place setting with my rustic stoneware plates from Anthropologie, then a pink plate, and finally a light gray bowl. Every piece is distinct, but still blends in together. The second I saw these napkins, I knew they’d be perfect for this table. 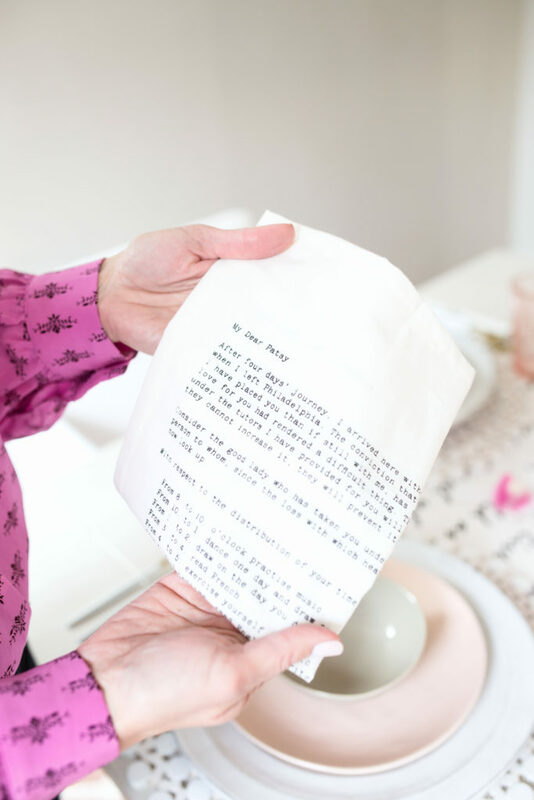 Vintage love letters were re-printed on tissue-thin white linen napkins. From authors such as Rudyard Kipling, Thomas Jefferson and Mark Twain, they take you back to life over a century ago. 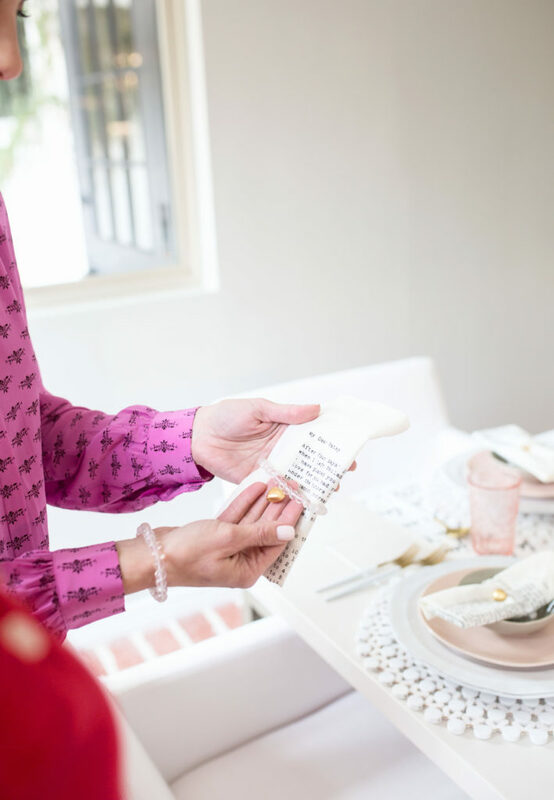 Vintage love letters from the early 20th century were so much fun to read – we took turns going around the table and everyone read their napkin. Life was so different back then! 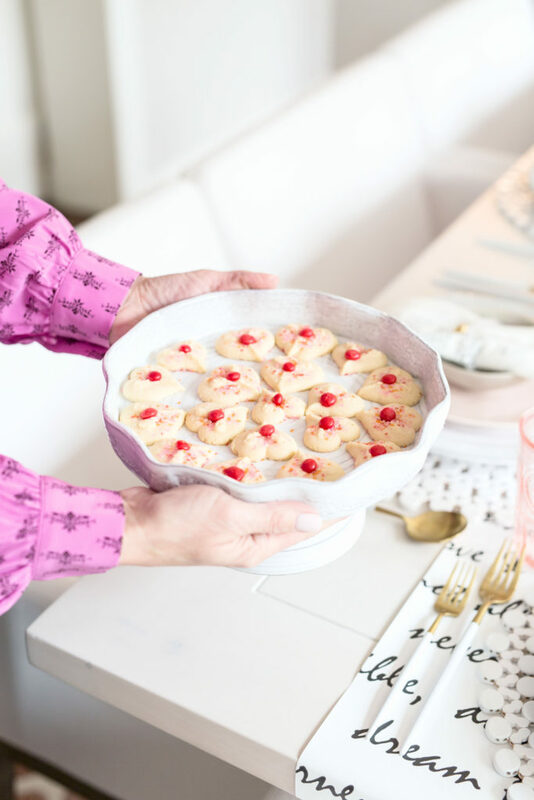 When my friend Julia contacted me about doing a project together, I jumped at the chance and knew that a Galentine’s lunch would be perfect opportunity to showcase both of our creative sides. Julia Winter left the corporate world over a decade ago to begin Jewel Ya https://www.jewelya.com where she was inspired to create original, timeless and versatile jewelry designs. Each distinctive piece in her collection is made by hand using superior quality natural metals, fine quality semi-precious and precious gemstones and are specifically designed to be transitional for multiple looks. Check out her How To Wear Videos if you are looking for ideas. Thrilled that Julia allowed me to be a part of the design process, we met several times to come up with a piece that would be versatile for everyone. We selected crystal beads and added a brushed gold heart charm for a bracelet – our special gift to our gal friends! 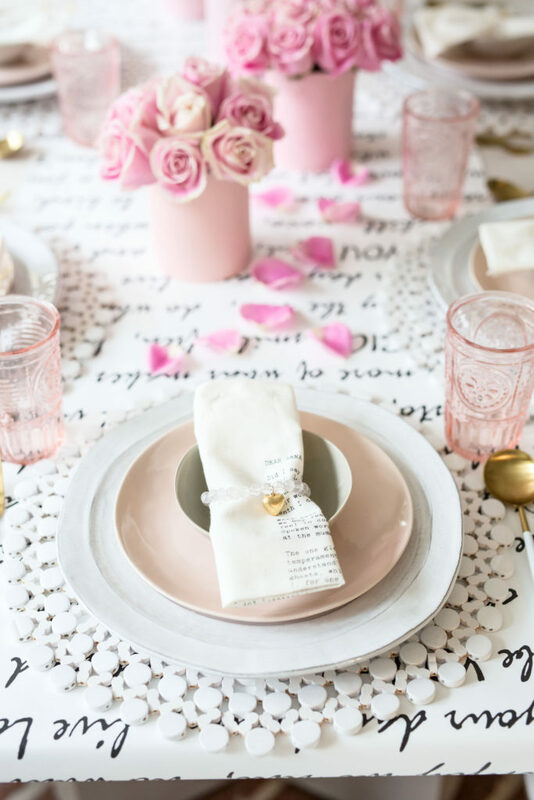 To integrate the bracelet into the table decor, we used the bracelet as a napkin ring! 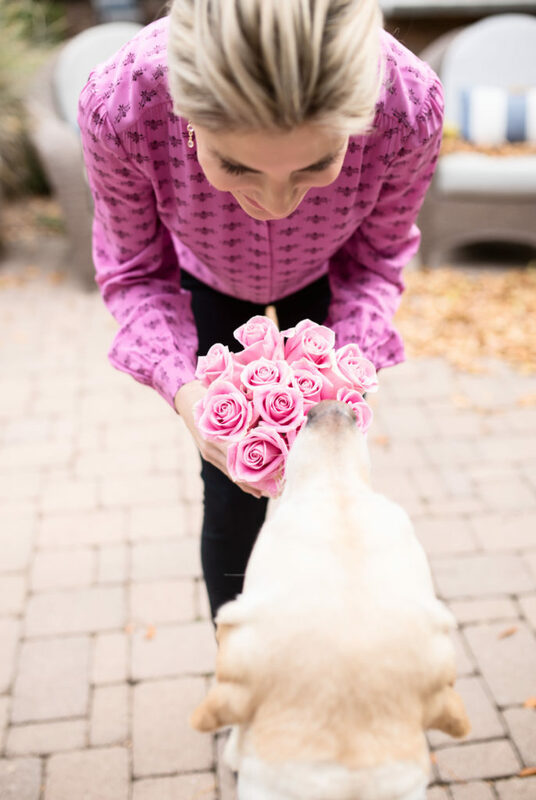 My floral selection is Palmer-approved! 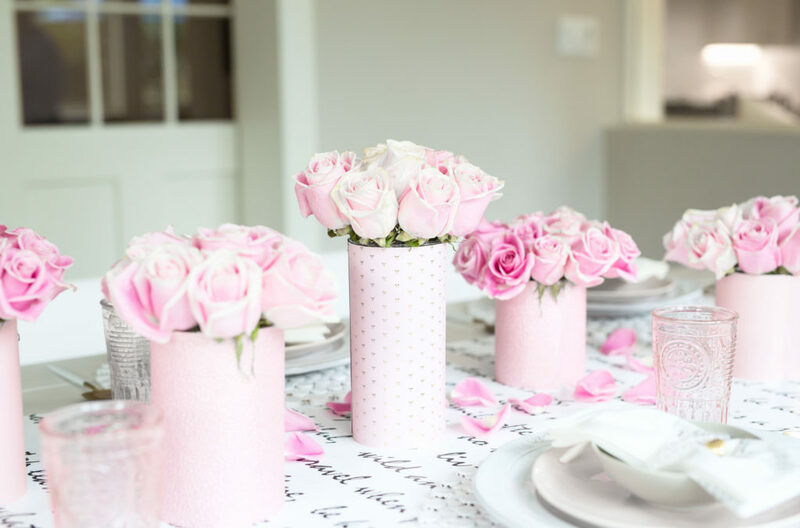 One flower variety type is always easiest to work with, rather than several kinds, so naturally, I chose pale pink roses for the table. 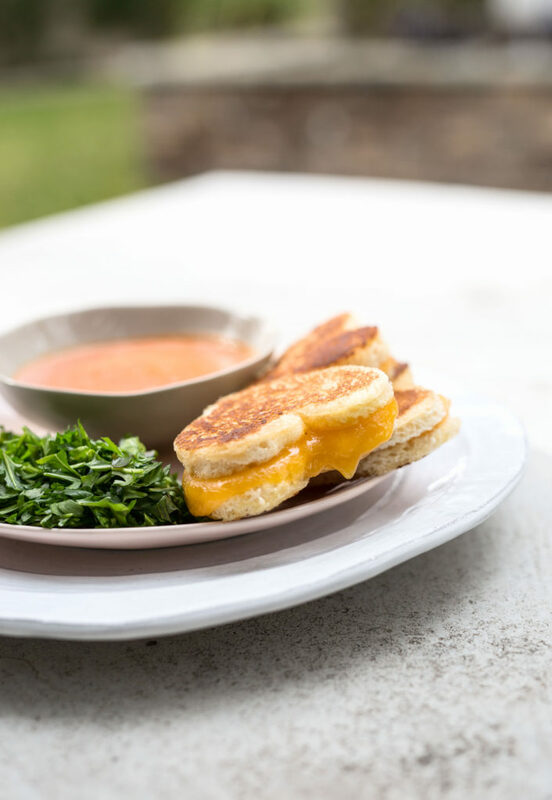 What could be more comforting than tomato soup and grilled cheese? My arsenal of glass vases is huge, but I didn’t have any pink ones for my table. Enter Michael’s. 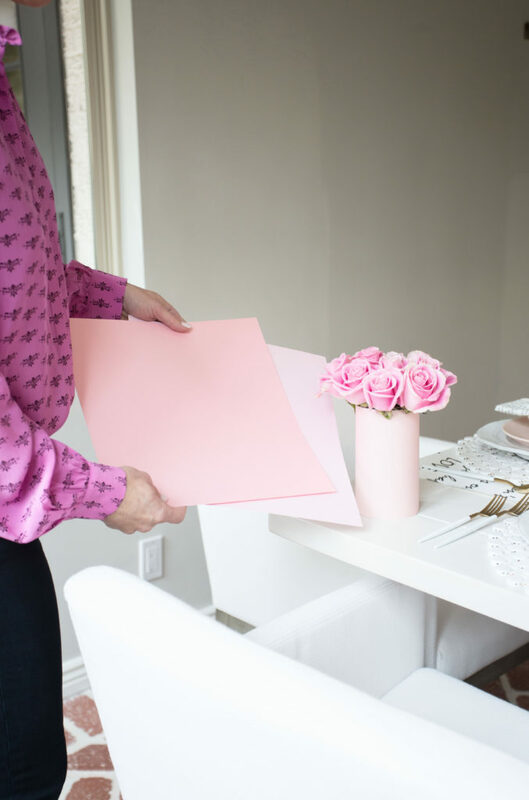 Their selection of scrapbook paper is massive, so I simply purchased a few sheets of fun, printed and textured pink paper and wrapped the vases with double stick tape. They easily peeled off after I was done with them and was much more economical than buying new vases. 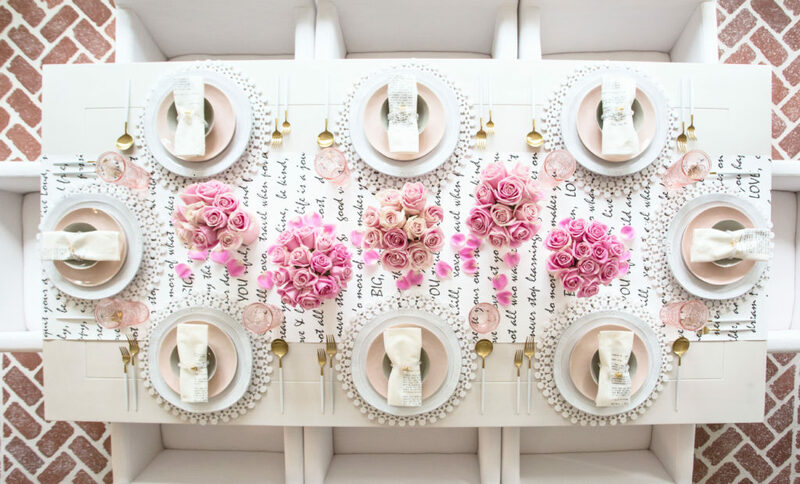 Leftover roses were picked and petals were scattered down the table for a little extra detail. How cute is the bracelet that Julia made for the party? Happy Valentine’s Day – here’s hoping you can carve out a little time to let your girlfriends know how much they mean to you! Seriously blown away with these details!! The wallpaper runner! Those napkins!! The bracelet napkin rings!! I could go on…it just perfect!!! So pretty and I just love the bracelet idea!